This is very true. Granted, this image applies to the testing of children in America, but the same applies to the formal testing in the Uk. 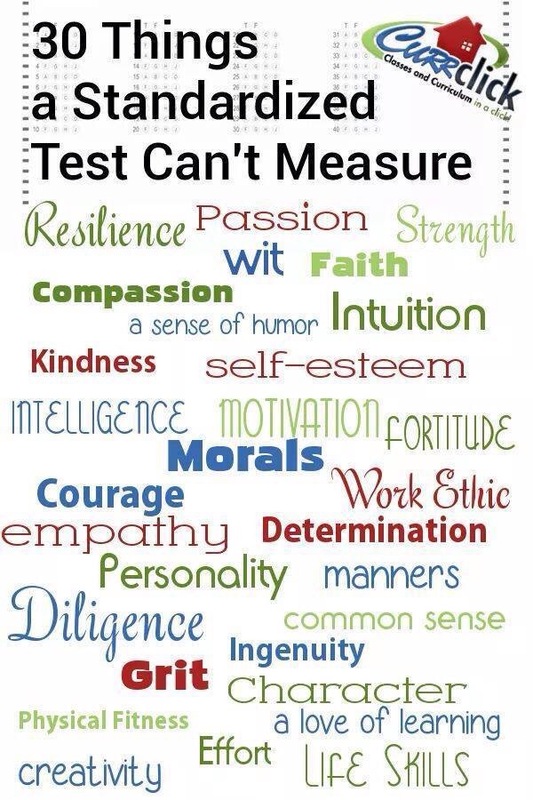 Tests can’t measure so many important things! Not to mention not all children perform well in tests; they only reveal a small part of the whole picture. Children are so much more than test figures and quite frankly the current government agenda scares me. They talk about improving and supporting, child mental health but then add frequent testing and a huge change in the expected standard of attainment. Children are going to be told they are not achieving, some of which, will previously have thought they were doing okay. Many adults don’t know what a subordinate clause or determiner is, but many will use them without realising in their writing. It makes me so cross. It doesn’t always give them chance to sparkle; or show the effort and hard work that has gone on; or the progress they have made both academically and on a personal level. Children will be burnt out and so will teachers! Tired teachers and tired children do not make effective learners.Developing all of these other attributes, and skills will support children making them more resilient learners, and it’s being able to learn that is key,when they are out in the real world. Taking on a new job, parenting, cohabitation.. They are all learning curves too. Help our children love learning, and not grow up with a fear of failure, mistakes should be seen learning, a positive to learn from. (Image shared from create abilities Facebook page, all opinions are mine). Previous Post What is in a name?